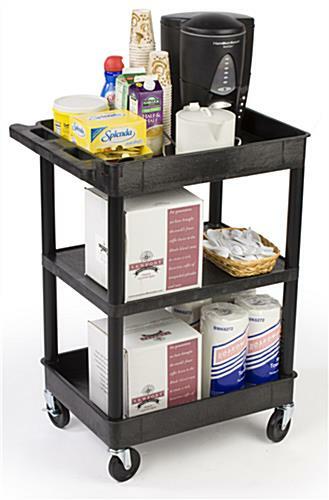 This storage truck, commercial cart is perfect for large restaurants that need inventory brought to different sections of the building! 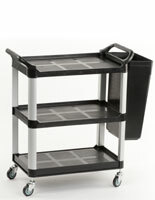 The three shelf design allows for ample space to tote around various supplies or equipment. 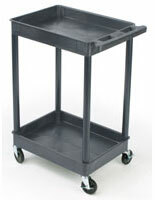 This commercial cart, such as a multi-purpose trolley or serving tote, has a smooth, easy-to-clean surface. 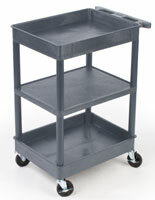 Made of polyethylene, a material which is durable as well as long lasting, the commercial cart is sure to last for years! 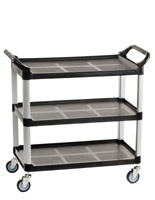 No matter what the task; this heavy duty hand truck will be able to carry large amounts of inventory or supplies to wherever they are needed. This commercial cart, including the two, 2-3/4" deep tubs and one middle flat shelf, is great for multi-tasking and will keep everything in place during transit. Shelf clearance is 12". This supplies dolly, commercial cart also has 4 casters that swivel in any direction for ease in steering! These heavy duty wheels work well even on carpeted flooring. 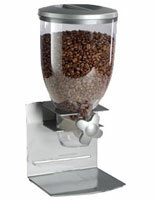 There are also two locking brakes for when you need the commercial cart to stay in place. 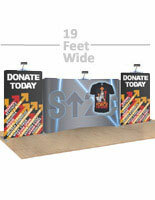 The tall, slim construction makes it easy for personnel to maneuver, even through busy areas within a building. 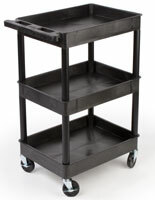 This multi purpose truck is a popular commercial cart most restaurants purchase for bussing tables! Please Note: This commercial cart is intended for two people to put together. A rubber mallet and hardware necessary for assembly are included.